I know! This wasn’t an actual Bway musical, but there are going to be some exceptions I feel necessary and relevant to include in this survey. After only his second Bway show, Frank Loesser was instantly elevated to Bway’s A-list pedestal, and his work reflects a seriousness of purpose on top of a glorious talent. Loesser & Moss Hart dove into Hans Christian Andersen as if it were a major Bway production—a feat still not realized tho it has been mounted lavishly on stage in London, and more recently deconstructed by choreographer Martha Clarke in a failed Bway tryout. As part of Loesser’s limited if vibrant oeuvre it deserves place in the discussion. Sammy Fain, another prolific Hlwd songwriter, like Loesser, also wrote at least five Bway musicals. But they were all flops (tho one, Flahooley, is sui generis.) Fain’s greatest hit was the 1953 Doris Day movie, Calamity Jane—a knockoff Annie Get Your Gun, which seems to have been almost an industry in the 50s. (A manqué TV version called Satins & Spurs, the first of Max Liebman’s lavishly promoted “Spectaculars,” on NBC, even tried it again with Betty Hutton—only to kill her career in a single night. And yet in 2010 you can pick up a CD of the score.) Calamity Jane was later staged in straw-hat and summer-tent circuits as a vehicle for Martha Raye or Carol Burnett—who later made it one of her CBS specials (broadcast 10 days before JFK was shot). By this next-to-Bway cred Calamity Jane might be argued for inclusion here, but Sammy Fain isn’t synonymous with the Bway musical the way Frank Loesser is. And there’s the whole difference. I believe I saw Hans Christian Andersen on TV when I was still in single digits. I have comparatively few memories before the age of 9, but that’s another story. The one other time I’ve watched the film was 20 years ago. To be truthful I was expecting to be a little nauseated, or at very least impatient with the movie, but it was strangely pleasant—albeit as postcards from another planet. Still I can’t imagine this appealing to children in today’s digital, mechanized, multi-distracting world. It has a wonderful old-fashioned quality, immeasurably aided by studio-built pastoral sets of 19th century Denmark—and how often does that come up in movies? The eye is always entertained here, which on more than one occasion is that needed spoonful of sugar helping the medicine go down. The film bills itself as a fairy tale about a teller of fairy tales, written by Moss Hart, and starring Danny Kaye. If that’s not gay enough for you, how about this line that Miss Kitty’s hubby actually wrote for Hans to inform a crowd of children: “You’d be surprised how many Kings are only a Queen with a moustache.” Hmm. Fairy tale indeed; Hans is an unmarried cobbler (pushing 40) with an unexplained 15 year old boy apprentice, and no apparent evidence of adult companionship. He invents fables to teach children life lessons but is clueless of his own delusions in falling for a married ballet diva. Rejected like a schoolboy fallen for his teacher, he returns home with his adolescent (and wise-beyond–his-years) ward, to start writing his oeuvre. As co-star Farley Granger, who hated the script but was bound by contract to Sam Goldwyn, put it: “boy meets girl; boy loses girl; boy gets boy.” He also wears red socks. So what is the moral of this fable? You be the judge. 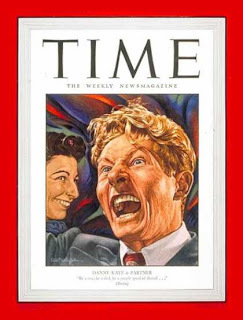 Most people I know seem to strongly dislike Danny Kaye. I think it’s the prancing. Let’s face it (no pun intended) Kaye is rather fey and effete. But he isn’t nellie. Not really. I suppose I used to prance around myself before I became aware it wasn’t manly. But Americans were far more tolerant of lighter men back in the 50s; when most people barely knew what homo was. Good God, look at the pass they gave Liberace! Ignorance let men be as prancey as they wanted. Kaye was hugely popular at the time; he’d made a series of hit movies in the 40s, developed & produced by mogul Sam Goldwyn; defined his own night-club style and was hitting stages across the globe in a vaudeville show. 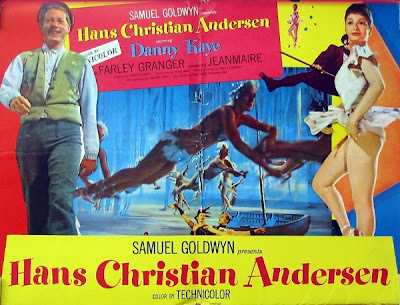 On completion of filming he traveled to Denmark in July ’52 in part to assuage Danish concern of the movie’s inaccuracies (which were legion). No matter, he was cheered and carried thru the streets on the shoulders of policemen. Kaye was adored the world over and in later years became associated with UNICEF, maintaining a rapport with children he demonstrated so clearly in Hans. I find it hard to dislike him, (tho some of his performances are a bit too manic) yet I know so many who do. He’s kind of a good looking chap on the reddish side—maybe he appealed to me for his prominent nose—a feature that personally plagued me in early life—but which he sports proudly. Here at age 39, he looks every inch a Dane, finely aged and even handsome in moments—one in which he strongly evokes Daniel Craig. On the other hand, haven’t you ever wondered if Mary Martin was really just Kaye in drag? I have. The fairy tale narrative exempts logic and reasonable motivation, so Hans can be talked into dropping everything in an instant and going to Copenhagen—which to Baltic locals is the cream of the crop, the top of the heap. His arrival reveals the movie’s most lavish set; a town square bustling with commerce. Loesser has each merchant sing their wares, but no actual song develops like in similar scenes in later shows (“Baubles, Bangles & Beads” in Kismet and “Who Will Buy” in Oliver! come easily to mind.) And then, forty minutes in, quite suddenly the film switches gears becoming The Red Shoes redux. But not the ballet-story part of Red Shoes, which is actually based on an Andersen fairy tale, but the director/diva psychodrama part, in which Hans gets himself naively embroiled. Well first he gets thrown in jail for disrespecting a statue—but gets bailed out thanks to his trade as a cobbler. His patron is Farley Granger (who was living with Arthur Laurents at the time), playing the brutish director of the Royal Danish Ballet, starring his wife and prima ballerina, Zizi Jeanmaire; a pert and gamine French dancer, who went by a single name in America—curiously, her last. Hans falls for the married diva and unable to express his feelings writes the story of The Little Mermaid as a new ballet for her. Billed as “the Famous French Ballerina,” Jeanmaire came as a package with her mentor & future husband, Roland Petit, director of the Ballet de Paris, who staged all the film’s ballets. Adored by Americans, Jeanmaire starred in a Bway musical soon after, The Girl in Pink Tights: about the accidental birth of the American musical in that 1860s mash-up, The Black Crook, but with an equally fictional story. The show, Sigmund Romberg’s last, was not much praised—but she was. Petit staged a French music-hall revue of her on Bway ten years later, when she was forty, but that was all we heard from her on these shores. And wouldn’t she have been perfect as Solange in Follies.? She and Petit are both still alive at age 86. After the success and acclaim of The Red Shoes and An American in Paris, ballet was in vogue in Hlwd like never before or since, and Goldwyn who spent over a dozen years developing his pet project was determined to outdo MGM. Red Shoes’ Moira Shearer was originally to star, with George Balanchine to direct, but production delays cost Goldwyn both of them. If Leslie Caron was the find of MGM, then he would discover his own Gallic gamine. HCA has four separate ballet segments; the first a rehearsal of the Royal Danish watched by Peter (the perennially worried apprentice). I couldn’t identify the music here, but I doubt it was Loesser’s. 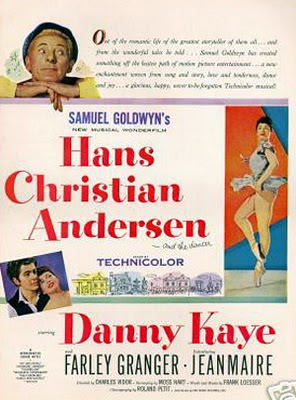 The second was a dream of Hans’ where he rescues the abused ballerina from her evil husband; a staged psychodrama that’s even danced by Kaye (whereas Granger’s role is filled by Petit). The third is another fantasy with Kaye; a reunion and instant storybook wedding to Doro on a gingerbread set with wonderland costumes. Let’s not forget this is from the pen of Moss Hart, who concocted that other Freudian travesty: Lady in the Dark, which put Kaye on the map. Whereas Liza Elliot’s dreams were obvious metaphors, Hans’s seem rather peculiarly arrested for a grown man’s fantasy—this looks more like a 14 year-old’s vision of a wedding. It’s not really a ballet either, or at least not for long, as without warning Jeanmaire suddenly plunges into “No Two People,” a jukebox ditty closer to Loesser’s own Oscar winning “Baby It’s Cold Outside” then any other song in this score. Strangely, it’s one of the highlights of the film. The final ballet and the film’s Main Event is every bit the challenge to the epic final sequence of An American in Paris: the debut of The Little Mermaid ballet—which the script needlessly denies to Hans’ viewing. The stage settings here are lavish, and impossibly transitioned for a theatre audience, but no matter. There’s some lovely flying mermaids “swimming” up from ocean’s bottom, and a thrilling exit into the “waves” at the end. But most dramatic is the central sequence in some grand hall, all scarlet red boxes and archways against black walls, below a high-domed navy ceiling. It’s a stunner and all the more so in contrast to the dominant aquatic palette of sea and shore. But a quarter of an hour is a long time to stray from the main story, especially heading into the final reel. 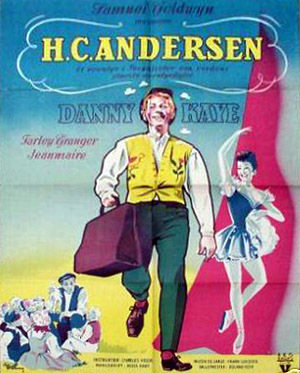 4 ballets, 8 pop songs, dozens of children, and Danny Kaye in 19th century Denmark. What a curious stew. Nearing the end of a long, lucrative producing career Sam Goldwyn promoted HCA as if it were his final masterwork, making it his biggest hit outside of The Best Years of Our Lives. (He would soon top that with another Bway hit.) HCA was a smash, and garnered 6 Oscar nominations. But Goldwyn was banking on a Best Picture nomination—like An American in Paris and The Red Shoes—and didn’t get one. Neither did the other hit musical of 1952, the not-yet-canonized Singin’ in the Rain from MGM. Kaye wasn’t recognized either, but was he ever (in his whole film career) in serious contention? He got an honorary Oscar in 1955 nonetheless—just for being Danny Kaye. Though snubbed in major categories the 6 nominations HCA received in craft fields (more than any Bway film adaptation we’ve seen so far) attest to Hlwd’s preference for honoring homegrown efforts. Tho none were won, the nominations were for cinematography, art direction, sound, music scoring, song and costumes—which were separately designed for the ballet and the main story. A Madame Karinska did the outré ballet outfits. They are quite something. The movie opened at Thanksgiving in New York, in two locations—the jewelbox Paris Theater adjacent to the Plaza Hotel, and the Criterion in Times Square, where it stayed put until May of 1953. This was a big year in Hlwd, when all the big guns were unleashed to challenge the outbreak of television; the intro of Cinemascope; the push for 3D; the rise of Marilyn Monroe. Hans was in the top five hits of the year. Six million doesn’t sound like much today—it’s a flop weekend gross for a Jennifer Aniston comedy—but in 1953 it was blockbuster. If it won no awards, Goldwyn cried all the way to the bank. The film premiered in New York on November 24, 1952. Two weeks and two days later (and a good two weeks past due date), I came into the world on December 10th. We all have our birth-signs and birth-stones and flowers; I think we also have birth-shows; that film or Bway musical unveiled to the world nearest our birthdate. The renaissance on Bway that would soon be recalled as the Golden Age of the musical, had, after 9 years gone into an extended lull in 1952; the one, and marginal, hit arriving in the heat of that summer, with Eddie Fisher on the jukeboxes wailing “Wish You Were Here” as I was incubating in my mother’s tummy. The fall season was equally discouraging, for plays as well as musicals. Even the long-running hits were losing steam, and no longer selling out. The one exception: Beatrice Lillie clowning it up in a greatest hits revue. Five days into my infancy, Bette Davis opened her own musical revue, Two’s Company singing “Turn Me Loose on Bway,” but Bway turned her loose in 3 short months. It’s almost eerie how The Big Street dried up just before my arrival. But then came the Spring of ’53, and shows arrived by Rodgers & Hammerstein, Leonard Bernstein, Comden & Green, Jule Styne & Cole Porter (My spiritual godfathers, if you will—Or is it just coincidence they’re all my favorites?) And then over the next dozen or more years Bway would produce a bounty of classic shows (and their movies) the likes of which we’ll never see again. 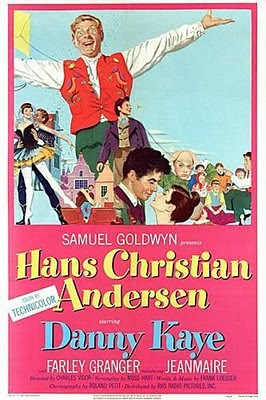 Maybe “Turn Me Loose on Bway” is a fitting birth-song for me, but my birth-show would have to be Hans Christian Andersen. As an only child of distant, immigrant parents, I was, like Danny Kaye’s Hans, given a solitary life; burdened with unbridled optimism; inclined to prefer “fairy tales” such as those told in musicals and their films. Happily delusional. Story of my life. Or is it the saving grace? A global survey recently found that Denmark has the “happiest” populace of any country on earth. Sometime in the early 1960s my parents planned a grand tour thru Europe. We were going to land in Germany, buy a VW beetle and take in 9 countries in 3 weeks. For some reason I was most excited of all about seeing Denmark and Copenhagen. Could that have been because of Hans Christian Andersen? They never made that trip after all. Neither have I. Maybe it’s time I did. Do you know your birth show?